Lately, I’ve just been clamoring for an old school JRPG. I’m just in the mood for turn based battles, spending all my gold on new weapons and armor, and a ragtag bunch of characters to go on my journey with. For all of these reasons and more, I am overjoyed that the PS2 classic Dragon Quest VIII has come to 3DS, even if there are a small handful of issues that prevent this from being the definitive version. Despite being an old school JRPG, the story does not begin with your village being burnt down due to circumstances that are vaguely your fault, somehow. 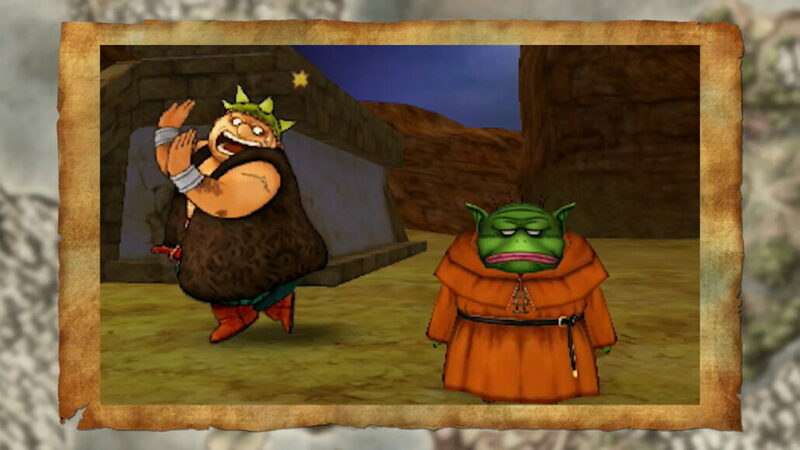 Instead, Dragon Quest VIII picks up with your silent protagonist traveling with the hideous toad-like King Trode and Yangus, a chubby cockney-type. It doesn’t take long before the plot of the game is set and you’re on your way: You’re assisting King Trode and his horse Medea in chasing after the ghastly Dhoulmagus, who placed a curse on Trode and his dear Princess, turning them into an ugly talking monster and a horse. What’s nice here is that the story is immediately underway – no need to establish the plot for two hours. This really makes the game feel like a journey, one already taking place as you join, and the way the game unfolds supports that. The world is made up of several islands, and using the touch screen you can see places you visited pop up on the map, a nice visual representation of the progress you make through the game. So how does it play? It’s a turn-based game, as I mentioned, and your party can face off against several monsters at a time, with attacks that can attack multiple enemies, buff your stats, nerf enemy stats, do more damage to certain types of enemies – the usual JRPG fare. Outside combat you explore a wide – if a touch barren – world filled with enemies and the occasional treasure chest. The overworld is hardly a sandbox, instead it’s just for getting from place to place, often following the path to the next town, or finding a hidden cave or village after getting directions from the townsfolk. The overworld gives you plenty of space to wander away from the path too, though there’s no guarantee you’ll find anything interesting. What really needs praise, though, is the wonderful sense of humor. Yangus’ cockney accent, referring to you as Guv’ and to King Trode as Old Codger, always makes me crack a smile. Characters you meet over the course of the game all bring a distinct personality to the game too. Jessica is upper-class, refined, though determined and strong-willed. She brings her own levity to conversations, as she disregards Yangus’ lengthy stories in a cheerful manner. Even bosses have a sense of humor, with many even referencing your return if you die against them in the first encounter. 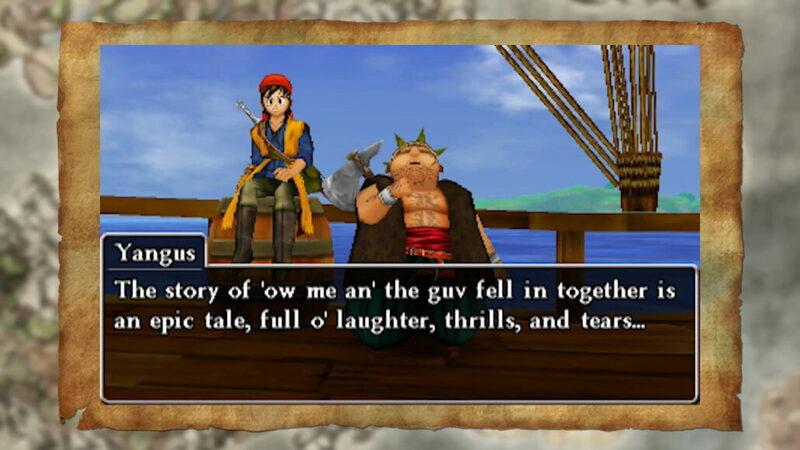 There’s something pure and simple about the journey you go on in Dragon Quest VIII, because although Dhoulmagus is your ultimate objective, the journey is its own reward. Each village you come across has its own story to tackle – often involving a travesty committed by Dhoulmagus himself, but not always. In one instance you mend the heart of a depressed king, mourning the loss of his wife, in another you salvage a crystal ball from a waterfall deep within a monster-filled cave. Each of these plotlines can be rewarding in their own way, so even when the main story is taking a back seat, the pacing feels pitch perfect. Though, there are a few drawbacks. Dragon Quest VIII looks incredible on the 3DS, sure, but textures have taken an obvious downgrade since the PS2 original. Everything looks much less sharp, and textures at oblique angles look incredibly blurry, which is very visible on the XL screens, though not too difficult to ignore. It’s nice that voice acting returns for more important cutscenes and the catchy, memorable Dragon Quest music is all here, though audio quality has taken a hit across the board, optimized for the 3DS speakers, and not a decent pair of headphones. Though ultimately, the fact that audio quality and graphics are my only complaints when talking about a handheld game speaks volumes. 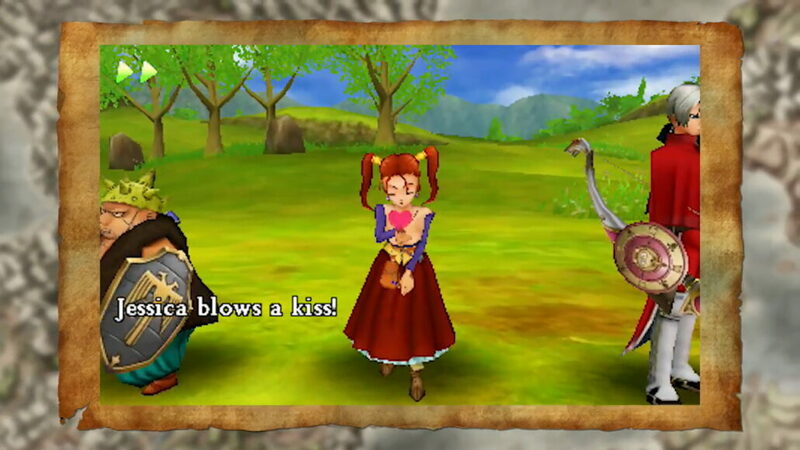 Dragon Quest VIII is hailed as a classic, and rightly so. Dragon Quest VIII on 3DS is a great place for new fans to jump on, as well as a perfect way for those who played it to relive a classic – and on the go, too! One of the PS2’s very best JRPGs is back, and it hasn’t aged a day.